normtec is a Small CONSULTANCY & SERVICE company Specialising in RADIOACTIVE and Other HAZARDOUS MATERIALs. normtec will be responsible to client management for advice and supporting services delivering safe and regulatory compliant policies for radioactive and other hazardous materials. We seek and deliver solutions consistent with ‘Best Practice’, company values and government legislation. We have over 100 years practical & managerial knowledge within our small team with with first hand operational experience in many fields within the nuclear and similar industries; including Radiological Protection, Decontamination, Decommissioning and Waste Management and R&D projects. We have gained recognition through international papers and national articles with noteworthy appointments on UK Working Parties and credited with three Patents. Past appointments include managerial, supervisory, safety and QA posts in facilities handling hazardous materials such as uranium, plutonium, tritium, beryllium, thermite and sodium. normtec was established in 2001 and commissioned to manage the impact of Naturally Occurring Radioactive Materials (NORM) throughout the life cycle of an Oil and Gas exploration site set in an environmentally sensitive location in the UK. We have retained continual employment with this major international company and were nominated for an innovative award in 2003. More recently, in 2010/11 we completed a thorough radiological mapping survey in the Middle East and provided radiological protection training for local staff. Our qualifications include practical and theoretical certification in Plant and Analytical Chemistry. We are fully trained and experienced Radiological Protection Supervisors (RPS) with recognised industrial training and standards in High Pressure Water Jetting, COSHH, Safety Management, and Quality Auditing. Moreover, our CVs demonstrate capability in a myriad projects from cleaning highly contaminated nuclear facilities to remediation of land and listed buildings. Since 2001 we have been able to transfer much of this experience across to other industries; particularly the Oil & Gas Sector in the Management of NORM. Ø Contracting to an accredited waste management company; providing On-Site assessment and waste treatment of NORM wastes in the UK. 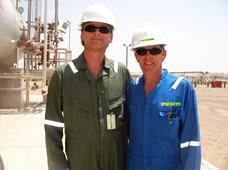 Ø Radiation & contamination surveys at a large gas plant in the Middle East. Ø Developing a robust Stabilisation/Solidification process for pre-treatment and disposal of Hazardous NORM wastes in teh UK. Ø Consultancy and Coordination of all NORM operations at Wytch Farm . Our role now leads a specialised team to control and manage NORM issues on the asset. After 8 years providing consultancy for BP our Radiation Protection Supervisor remains on site to coordinate and supervise daily operations for Perenco. Ø Decontamination of highly radioactive facilities rooms and caves. Thus, we have proven abilities in many challenging projects, including safe decontamination and decommissioning of radioactive and hazardous facilities, plant and equipment. Indeed, we communicate our experience to others through conferences and local presentations to management and workers alike. Safety. Our priority is safety - to ourselves, work colleagues, the public and the environment. We will identify hazards, assess the risks associated with our activities and take appropriate action to manage risk. We work with our clients to meet their safety objectives and require our contractors to meet these standards too. Health. We recognise that safe operations depend on technically sound equipment and working practices - and competent people. Thus, we will ensure staff, contractors and partners are informed, trained and competent in their roles and responsibilities and engaged in good health practices. Environmental Protection. We aim to protect the environment and promote ‘Best Practical Environmental Options’ by re-use and disposal. We minimise, sort and recycle where possible the wastes generated by our activities. Where pollution exists, we assist our clients in remediation. Risk Management. We aim to anticipate and prepare for emergency situations through thorough ‘Method Statements’, prior Risk Assessments and training of personnel. Regulations. We comply with legislation and Codes of Practice applicable in the areas we work. In the UK these include the Ionising Radiations Regulations, Road Transport and Environmental Protection Regulations. In addition, we liaise and comply with our client’s HSE standards and expectations. Indeed we will be proactive in ensuring compliance. Sustainable Development. We are committed to assisting our clients in continuous improvement. Through our own efforts, and those of associates and partners we develop training and implement ‘Best Available Technology” for social and environmental issues. Quality Assurance. We adopt our clients’ quality requirements and are committed to ensuring these and associated HSSE aspects are satisfied. Thanks for this information. I will discuss your suggestion with …………….. during their annual audit in November before committing to procedural changes and acquisition of the reference. I should also say that assistance given last year to help material enter landfill, your recognised standards of work at site and peripheral work such as that identified in your mail below caused us to commend normtec to ………………………. at a recent site meeting. I am looking for a Chairman for the NORM conference which I have produced. I was wondering whether you would consider taking up this position or indeed whether you have any suggestions as to who could take on that position. I have attached the NORM brochure for your perusal and I would be very grateful if you would be able to let me know if you are able to participate. Our contributions have been are recognised and we come recommended by a major Oil & Gas Company. I am writing to confirm that Mr Roger Bond of normtec(RDB)Ltd is currently engaged at BP Wytch Farm in the role of specialist consultant. Since 2001, his responsibility, has been to lead a small specialist team in managing all aspects of NORM arising from our exploration activities including; radiological protection, storage & transport, sampling & analysis, decontamination & disposal and regulatory compliance. Naturally, we remain pleased with his contribution and can recommend his appointment.